No theme this month, Legions of the Unspoken, so let us take a closer look at a character who has been in the limelight recently. You may have heard about the Supergirl show coming soon to the small screen. You may even have had a significant other asking which comics featuring the Maid of Might they should read. Hopefully you shrugged and pointed them towards Thunderworld because Mary Marvel is close enough. Supergirl is an interesting character. She has been around for decades but I could not, for the life of me, tell you an interesting thing about her. Before I started reading comics Supergirl had been murdered during Crisis on Infinite Earths but, strangely enough, she seemed to be doing just fine in the halcyon days of the S-Shield numbered covers of the Superman titles. What happened? Did she get better with the reboot? Did Zero Hour kick her back into her prime? No, of course not. Lex Luthor from a pocket universe cloned Lana Lang and the ensuing “protomatter being” helped John Byrne’s Man of Steel defeat General Zod before coming to the core DCU and promptly banging Lex Luthor while his mind was occupying his own cloned body and masquerading as his son to the world at large. In case you were wondering, yes, that ginger chinstrap is genetically predisposed as it appears on a freshly baked clone with no indication of having been groomed that way. This Supergirl was not Linda Danvers. She never wore the white tee-shirt, had flaming wings, or was served a drink by Der Führer (as you Fallen Angel fans may recall). This Supergirl is Mae, short for “Matrix,” and she was the version of the character that ushered in the nineties. She is unique from what came before, and has been overshadowed by what came after. In true Roger Stern fashion her story was unique and worthy of your time. 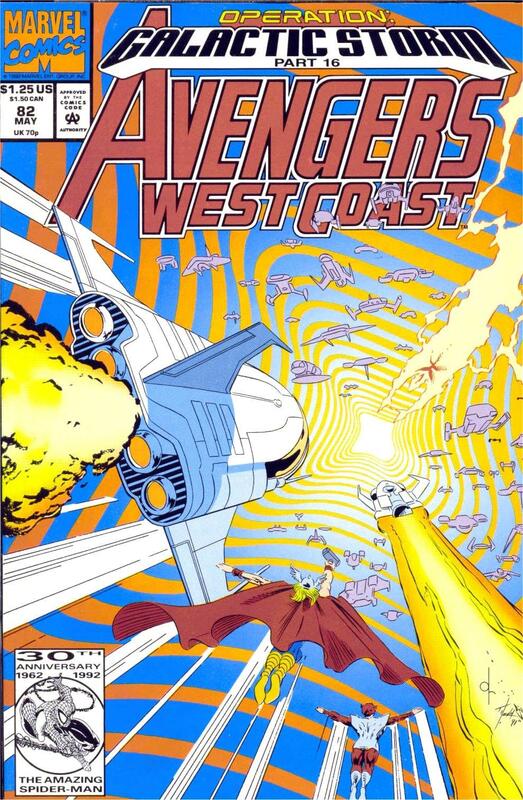 In the early days of 1994 Stern, along with artist June Brigman (co-creator of Power Pack and one of the only woman I can think of to draw anything related to Superman) helmed a four issue mini-series that explored the backstory of the Woman of Tomorrow (I am coining that because typing “Girl of Steel” is going to end me up on a watch list) and her place in the DCU. It features Lex Luthor II prominently and does a fair job at tying that particular plot thread up. Not sure what your reading habits are but if you enjoy what you read here you can buy the series from “comiXology” (I love them but that branding has to go). What would come to be defined as this era’s Supergirl mostly came later, from Peter David, until it was promptly overturned by Jeph Loeb. You may also remember Dan “The Man Without a Plan” DiDio telling a roomful of confused onlookers that Matrix had been stricken from continuity. 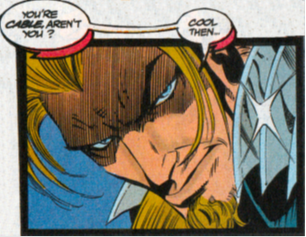 I forget if this was before or after he told similar rooms of people that Stephanie Brown had never really been Robin or that he could not wait to kill Nightwing (I do not know about you but I will never forgive him for Beast Machines never mind his DC work). Anyone else get a Kevin O’Neill feel from this art? If he ever gets tired of drawing Alan Moore’s Public Domain Fanfic it would be great to see a Supergirl story from him. The powers that be have done all they can to wipe away the version of Supergirl I first met. She deserves better. 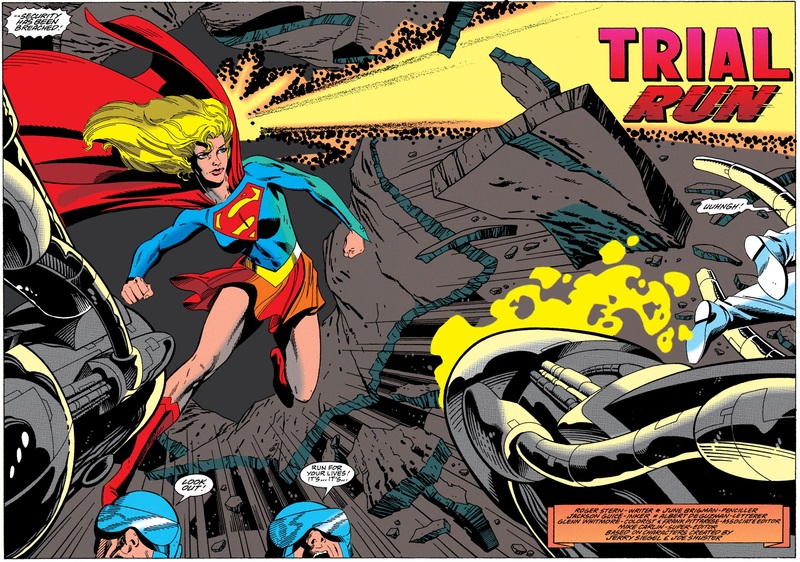 This was a Supergirl that had been as different from her former cousin as possible while also acting as a perfect reflection of the Superman brand, and superhero comics in general, at the time. Mae is young. Very young. She is, at best, a teenager and that is if we estimate the comparable life experience that a protomatter being has compared to a traditionally defined person. She is energetic, curious, and prone to fits upon discovering that her trust has been betrayed. She is exactly the type of teenage superhero we have seen time and time again except instead of trying to be her own person she must grow in the shadow of Superman with little of her own light filtering through. Mae can shapechange, telekinetically repel everything around her, and generally heal from any wound. She is fluid and not restricted to one thing or another, even gender, as she reminds the omnipresent doctors and scientists who serve as the perfect excuse for a bit of the old exposition. She has only chosen the form that we all know and love because it was Superman who rescued her from her own dying world and brought her to his, complete with the only type of life he could provide: A version of his own. She dresses like him, befriends Lana Lang, and is raised by the very-much alive, and surprisingly spry, Ma and Pa Kent. I realize now just how much I never wanted to see Martha Kent from that position. At least Jonathan’s being heart healthy, despite that battle being unwinnable. She has been forced into this role and this life, her potential squandered. She could have been anything she imagined but instead she must settle for keeping the Supergirl copyright alive and well. Despite his manipulation, Lex at least asks Mae to question what she can do and how she can do it. There is a chance here to present a very different character than the one that came before. The previous Supergirl had to run and hide in an orphanage because her cousin thought that the world was not yet ready for a woman with superpowers to be helping him in his crusade to protect every man, woman, and child from increasingly insane disasters. Mae is not burdened, as her subsequent version will be, with being a literal Angel of Heaven. She is not trying to accept her destiny but find her place in the world. She is the sole survivor of her world and literally the only one of her kind. Her struggle for identity is entirely separate from Superman’s. During the Silver Age he knew that he was not alone once he met Supergirl but Mae will never experience that. Her life is one of potential solitude but she denies it in favor of embracing the world around her. Installing the “Superman.exe” character model may have been the best way to save a few citizens from the Kryptonian criminals who destroyed her world but it also means that she will be best well known for impersonating Clark Kent after Superman “miraculously” returned from the dead. The people who surround her remind her what a heel Lex Senior was and judge her for being with his “son.” The inevitable reveal of his shenanigans serves as a wonderful origin story but is squandered as well. Lex, unsuccessfully fighting the effects of Kryptonite radiation poisoning, has decided that the world cannot possibly live without him, regardless of the fact that it was his own hubris which brought him to the brink of this particular flavor of disaster, and does all he can to stave off death. This includes seeing if he can reinvent the process that his alternate version used to create Supergirl in the first place. Ill defined, psychokinetic powers? Dark, nebulous appearance when enraged? 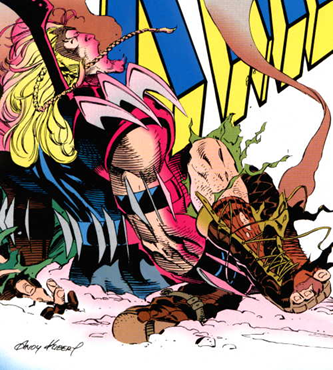 This is why Supergirl fit well with the Legion of Super-Heroes, she was an X-Man. Mae’s journey in many ways embodies what a fictional character must go through. She began life as sentient protomatter, no more than a medium for ideas to flow into. Stern does a wonderful job at reminding us that Supergirl is not all powerful and does have the limits you would expect of someone still learning to control their abilities. Her appearance, gender, nationality, and superpowers were defined by those around her. Next comes the inevitable confrontation with copyright laws. Supergirl is a brand just unique enough from Superman to be separately marketed and sold on its own. Not in real life but this is true within the bounds of the DCU. Lex assures Mae that this is in her best interest and that none of the money will ever be used to fund a cause that she would not support. Though not followed-up on in any specific way (this version of the character would not receive an ongoing series) Mae is confronted with funhouse mirror versions of herself that Lex has created. Each one comes from their artificial wombs complete with costume and defining characteristics. None of them look like Mae, exactly, but they do not have to. Lex owns the copyright of what she is so why would he check with her before going to market with versions he believes will do well? The protomatter that Mae is created from can form clothing and so some versions have chosen the less flattering wardrobes of the female superheroes of the day. I hope this is scathing commentary on the art practices of the industry at the time because otherwise I have no idea what is being shown here. Supergirl is no stranger to having to prove herself against copies. She herself was created by Otto Binder, the same man who created Mary Marvel for Fawcett Comics and she was arguably surpassed in popularity by her Earth-2 counterpart Powergirl. Here she has the chance to prove to her aggressors that she is her own person and does so with “psi-blasts,” a power Superman never had. Mae is held back by needing to be as close as possible to the idea of Superman. That brand cannot be altered, as too much merchandising rests on its shoulders, and it forces Supergirl to stagnate. If nothing else, it would have been great to see a character who could shapeshift into and out of her secret identity without needing glasses, a slouch, and criminally unaware coworkers. We see part of this potential in what comes next. Unlike Clark Kent, Mae has no way of dealing with the ills of the world. No moral compass was installed as part of the “raised on a farm” service pack and raw, righteous fury leads her to take the fight to Lex. Her shape changes, almost unconsciously, and all limitations leave her. Why should Lex Luthor, father or son, be allowed to continue committing such despicable acts? It is here that Superman makes his first on-panel appearance as he saves Lex and steers the story back into the comforting waters of what each and every reader unfortunately thinks of when they think of a Superman story. Not that we need a Supergirl who murders anyone (David S. Goyer was still only writing “The Puppet Masters” when this comic came out) but here we are shown that she is not even allowed to express her own rage. Yes, Superman teaches her right from wrong and yes everyone involved would have regretted Lex falling from a skyscraper but part of me will always look fondly upon the time the version of Supergirl that I first got to know threw an awful, decrepit supervillain out of a building. I remind you that the man who once stole forty entire cakes was bedding a teenage (or younger) girl using a cloned body and purple turtleneck. Yes, those are spikes on her arm, and no they are not adequately explained. It is as if she said her “magic word” but instead of the Wizard Shazam answering it was Rob Liefeld. Matrix is one of those wonderful anomalies from the nineties. She made sense within the context of the cold, clinical Krypton imagined by Byrne and developed by others, including Stern, with characters and concepts such as the Eradicator. This was a time in Superman’s history when his unflinching morality seemed all the more impressive for being set against such an impersonal heritage. Mae was the supporting character that this version needed and she could have been a notable and complex hero in her own. Lex may hate Superman but no one will ever hate Lex as much as Mae. She returned recently in two-part Convergence story. If you read it, let me know how it is. Keith Giffen and Ambush Bug are a good time no matter what. Things Just Got – X-TREME! Greetings Legions of the Unspoken! We have a special guest author today, Sir Tawmis of Comic Relief Podcast has come on by to give us a write-up on one of, if not the, most 90’s characters, ADAM-X…THE X-TREME!!!! Thanks for the great work, Sir Tawmis, and don’t forget to scope out the great work they do over at Comic Relief Podcast! 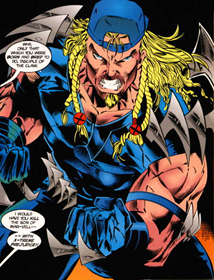 Allow me a moment to talk about X-Treme, or as I like to call him, simply Adam-X. While I talk about him and his origin – I will also highlight some of the things that put Adam-X at the top of my favorite character list – of all comic book characters. First, I admit. I am a sucker for the obscure characters. I think a lot of that has to do with, deep down inside, I am a writer yearning to flesh out characters who are just begging to have their origins explored – then unleash that untapped potential! There are few characters that have more potential to be an amazing character than Adam-X. The character known as X-Treme was created by Fabian Nicieza and Jeff Johnson, and he first appeared in X-Force Annual #2 (October 1993). In his appearance, Adam-X is hunting down a friend named Michelle Balters (who also happens to be a mutant by the name of Neurotap). 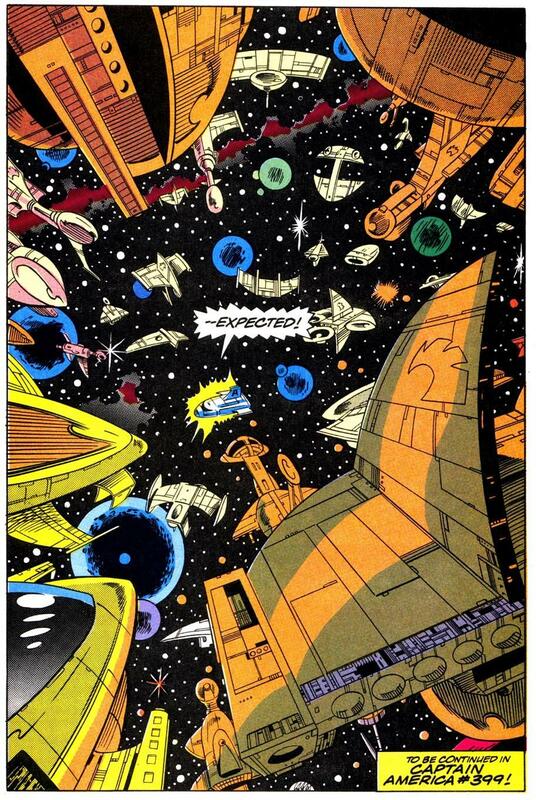 X-Force, led by Cable, arrive at the scene and attempt to take down Adam-X. However, Adam-X is easily able to defeat all of the members of X-Force by cutting them, then igniting the electrolytes in their blood. So when Cable gets taken down – and not by a team – but a single individual – along with the rest of X-Force? That added so many marks on the “Positives” side of the character, that perhaps, to this very day, that’s why Adam-X remains my favorite character. Naturally, Adam-X eventually teams up with X-Force, and together, they discover that Adam-X’s employer, Martin Strong is a little shady. And in “natural comic book team up fashion”, Adam-X and X-Force take down Martin Strong. By the end of the issue, Adam-X is offered a position to join X-Force, but he declines the offer, explaining he wants to find more clues to his past. It wasn’t long before Adam-X would encounter one of the members of X-Force again. As luck would have it, Adam-X found himself being abducted and dragged into MurderWorld, where he was forced to fight Shatterstar, from X-Force. The two were equally matched, forced to fight to save a woman’s life. However, it finally came down to the two heroes teaming up and realizing the only way out of this was to fight the one behind it all – Arcade himself! 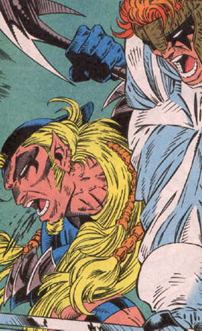 Together, Adam-X and Shatterstar were able to infiltrate Arcade’s hideout in MurderWorld. Arcade quickly (in order to preserve his own life), gave up the information as to who had hired him to abduct them and put them against each other. As it turns out, someone by the name of Mr. Milbury had wanted Adam-X to be tested, and what better warrior that was evenly matched with Adam-X’s skill than X-Force’s Shatterstar. (Well, if you’re an avid read of the X-Men books, you know Mr. Milbury is an alias for none other than the most sinister of X-Men villains – Mr. Sinister himself!) But what interest would Mr. Sinister have in Adam-X? We’re getting to that, don’t you worry! This entire fight takes place in X-Force #30 – and if you enjoy a good fight between two heroes, pretty evenly matched, I’d recommend picking this up. The next time Adam-X appears is in X-Men #39, when he witnesses a plane crash in Canada. 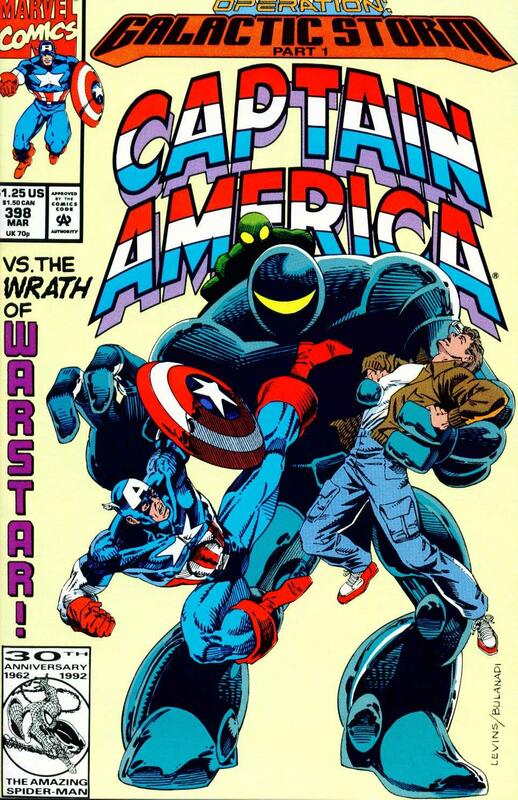 He rushes to the site of the plane crash and pulls out the pilot, who just so happens to be Phillip Summers, the grandfather of Scott Summers and Alex Summers (better known as Cyclops and Havok, respectively). Adam-X manages to use his power of igniting electrolytes to keep Phillip Summers warm throughout the night as the freezing temperatures continued to plummet. Fashioning a gurney, Adam-X pulls Phillip across the frozen tundra and gets him to a hospital where Scott and Jean rush to the hospital to check on Scott’s grandfather. Adam-X is there and asks Jean Grey to share his memories with Phillip – allowing him to vicariously live through Adam-X’s memories. Unbeknownst to Adam-X, Scott, Jean – they’re being watched on a monitor, by someone with a red glove (later to be revealed as Erik the Red). 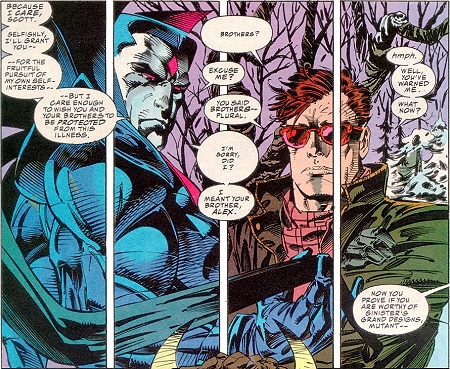 Even stranger – Erik the Red is being watched because he is watching over Adam-X, by none other than Mister Sinister. After Jean links the mind of Adam-X and Phillip Summers, there’s a narrator’s note of: Scott can’t help but feel that his fractured family lines have been made stronger because of this near-tragedy. Little does he know how terrifyingly right he is. Fabian Nicieza was laying down the ground work to make Adam-X related to the Summers family. As a matter of fact – Well, I am getting ahead of myself. Let me show you more of that ground work that Fabian had created to make this work. 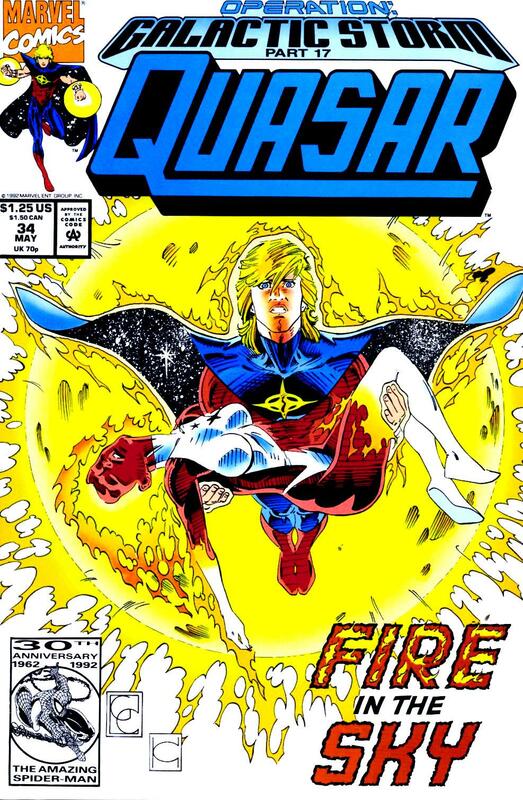 Adam-X’s tie to the Summers family continues next in the pages of Captain Marvel, which stars Legacy (the 90’s version of Captain Marvel and the “genetic son” of Mar Vell). Once again, the typical hero fighting hero is how the issue begins – with Adam-X, being mind-controlled by Erik the Red to attack Legacy. 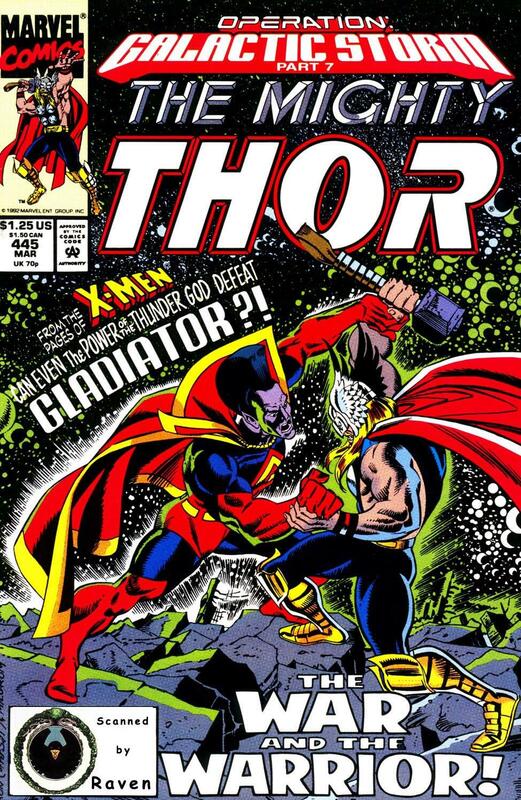 Adam-X manages to become free of Erik the Red’s control, but still finds the urge to fight Captain Marvel. You have been dubbed the Forsaken One, Adam – but that was a mistake on the Majestor’s part, those many years ago. Truly had you been rightfully admitted into the family, we would not be in this predicament today… I am talking about your destiny here… and that is something obviously enough by the intricate plans of the Crystal Claws which should not be rushed! Empress Lilandra sits on the throne this day only because Majestor D’Ken was driven mad by his experiences inside the M’Krann Crystal! She was not meant to guide the Imperium. You see Adam, YOURS is the destiny of power – for you were bred to introduce a HYBRID of specific genetic potential into the Shi’ar monarchy! Adam-X, you were born to rule the Shi’ar Imperium! Who else should be the heir to the throne of the Imperium but you – the only living child of Majestor D’Ken! So, let me just put it out there. 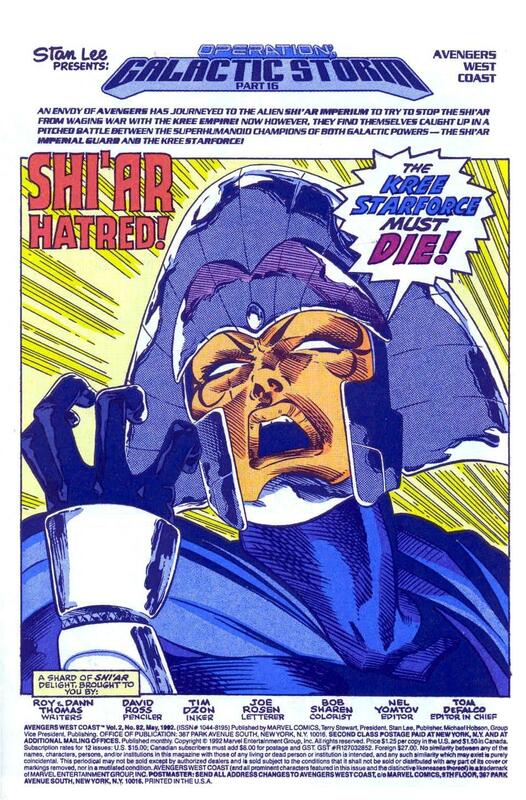 As a huge fan of the (old) Uncanny X-Men, I can’t put into words how much I love the Shi’ar. 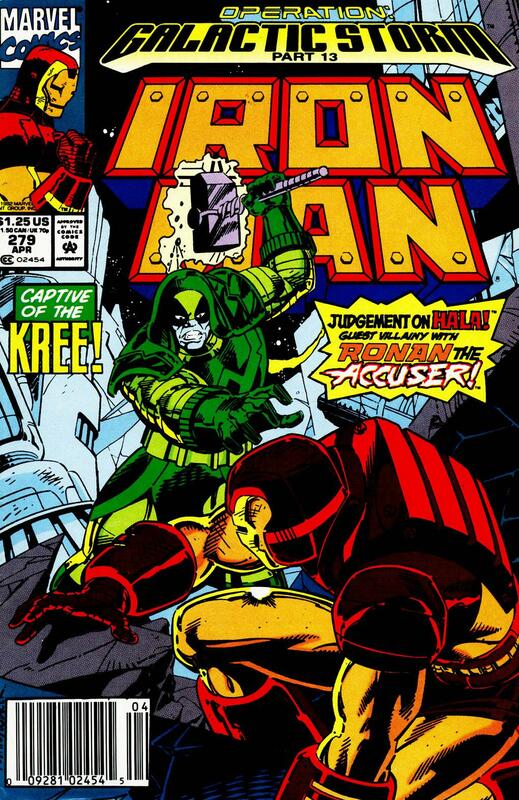 So now, here’s this character – that I am already digging for quite a few reasons – and now they’re telling me he’s related to someone of the Shi’ar Empire – and not just someone – but to D’Ken himself! Unfortunately, as fate would have it, in 2006, Ed Brubaker introduced “a mutant that would shake the foundation of the X-Men” – none other than Gabriel Summers, better known as the mutant, Vulcan. 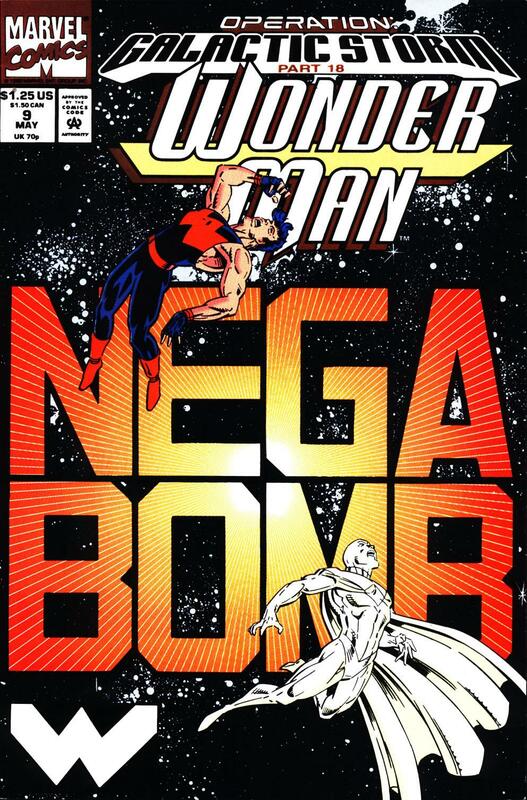 Vulcan was introduced in X-Men: Deadly Genesis #1 which essentially rewrote a large portion of the “Bible” of X-Men comic books – it rewrote Giant Size X-Men #1, stating that after Cyclops and his team had been defeated by Krakoa – Professor Xavier sent in Gabriel’s team – which consisted of himself, Petra, Darwin, and Sway – all of whom, save Gabriel were killed. The answer. Mind blowing (literally!). Apparently, so driven by guilt and shame of sending Gabriel’s team to the slaughter (though it was revealed later that Darwin survived), Professor Xavier erased everyone’s mind who knew anything about Gabriel – and the other members of the team. Now, let’s bring this into scope a little. Erase every single person’s memory who knew about Gabriel (or any of the other members of his team). This would include Scott’s parents, brother (Alex), their grandparents, friends, teachers – the scope is mind-blowingly massive – and he would have had to done this for each of the members who perished from Gabriel’s team. To this very day, I try to figure out – what the editors were thinking. Here, we have Adam-X, already being eluded to being related to the Summers family. Over there, we have Gabriel, who we have to rewrite Giant Size X-Men #1 and come up with this whole ploy that Professor Xavier has wiped out the memory of everyone who knew Gabriel. 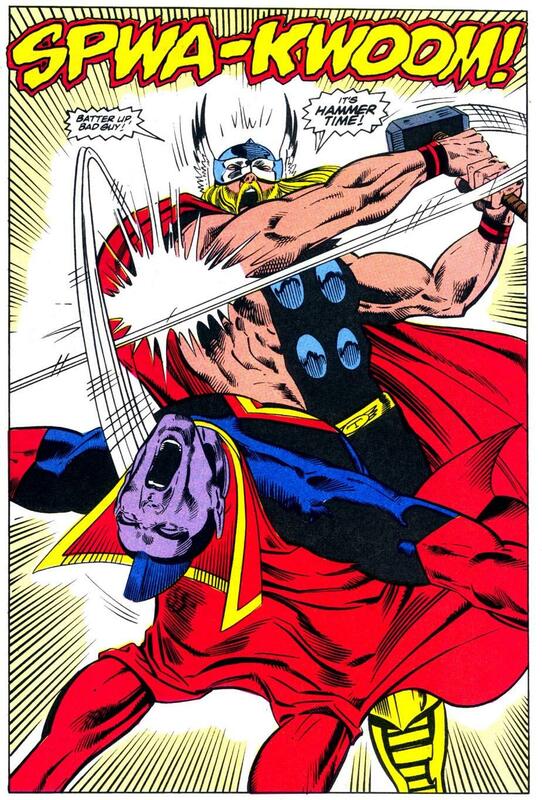 (Makes you wonder why he never wiped out the memory of anyone who knew John Proudstar, when Thunderbird died so soon after the Krakoa incident fighting Count Nefaria)! Years would go by before Adam-X would appear again, unfortunately. 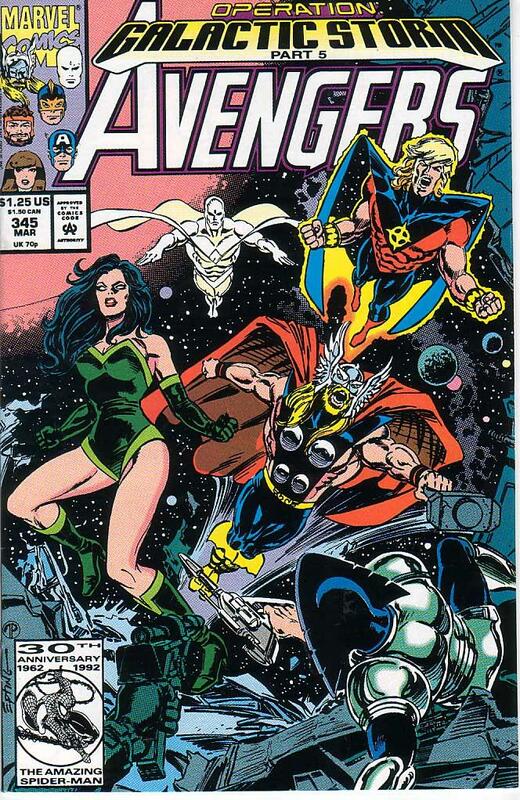 Marvel had shuffled him away for a number of reasons – one of them being that they were worried that fans would become “confused” because at the time there was an X-Treme X-Men being published monthly. 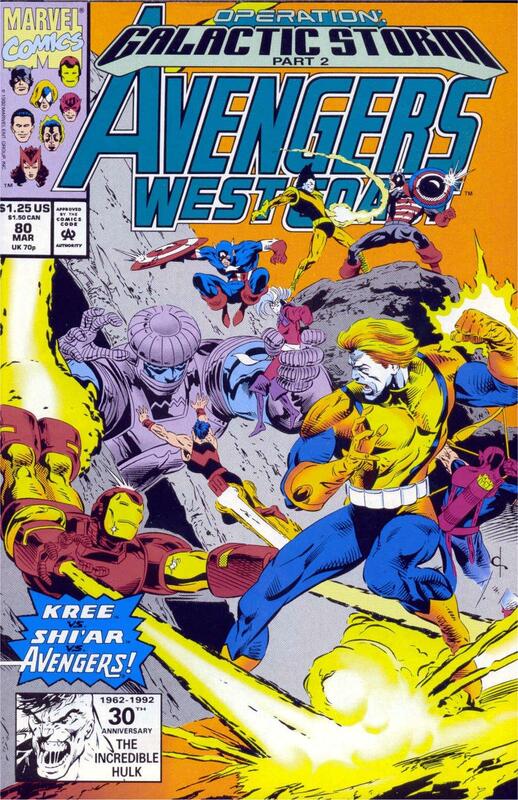 (Because fans wouldn’t be confused by the ten other “X” books and Avengers books being published monthly apparently… the fans could figure that out, but apparently couldn’t figure out why a character named X-Treme wasn’t in X-Treme X-Men… because… that rational of thinking sounds logical). It’s because of this, that I refer to X-Treme as Adam-X instead. When he next appears, it’s in Uncanny X-Men #513 / Dark Avengers #7 (in 2009). He’s joined several other mutants (Hellion, Match, Lorelei, Avalance, Meld and Sunspot) in an attempt to over throw Norman Osborn who is essentially running everything. Norman Osborn sends his “Dark X-Men” after the small team of resistance – which consists of Cloak, Dagger, Weapon Omega, Namor, Mimic, and Daken. While I was thankful to see Adam-X surface again, I cringed at the dialogue he was given, as he was essentially written as over the top parody of himself (and all things 1990). It’s painfully clear that Adam-X was added just to mock himself. But again, at least it was nice to know he wasn’t completely forgotten. 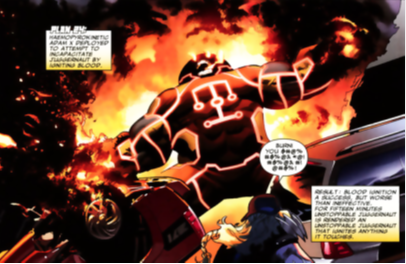 He’d appear one more time, in Uncanny X-Men #542 (October 2011) during the time that the Norse God of Fear grants incredible powers to a number of super powered beings – one of them being Juggernaut. 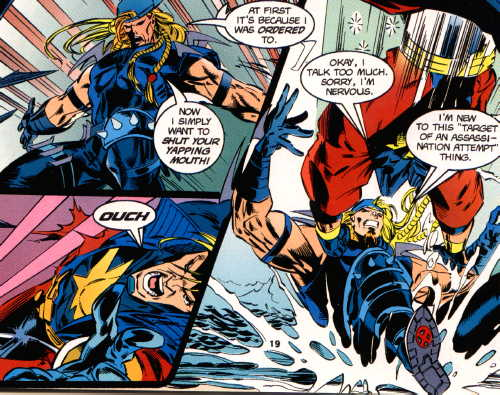 Cyclops calls on Adam-X, who appears (back to his original attire) to try and stop Juggernaut. Several others attempt to stop Juggernaut before Adam-X arrives. Avalanche attempts to separate the road; but Juggernaut continues to walk. A mutant named Face, blasts him with his ‘annihilation beam’ which proves ineffective; Pixie attempts to teleport Juggernaut away, but it’s ineffective; Rogue attempts to absorb his powers and render him unconscious; she is instead, rendered unconscious and rescued by Magneto. 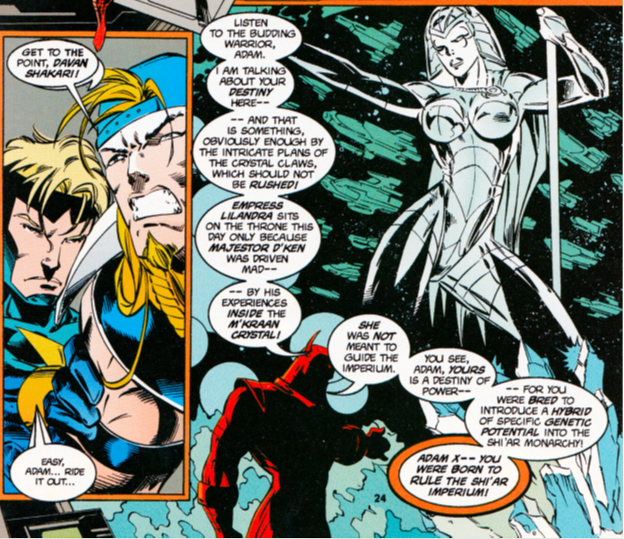 Mercury tries to fill his lungs; but she’s expelled, when she realized she was being dissolved while inside Juggernaut; Pyslocke tries her psychic blades, but they too, prove ineffective. Adam-X is the only one, who proves effective in doing anything to Juggernaut; he manages to ignite his blood, however, the downside is that Juggernaut, for fifteen minutes burns anything he touches. I had hoped, if the latest Cyclops series had continued (which had the time misplaced Scott Summers traveling around with the now living Corsair) – that somewhere in their space adventures, the writer would bring in Adam-X and perhaps elude again, to the family connection (and perhaps have a Shi’ar adventure). Until then. I will continue to fight for Adam-X.